Zion National Park in Utah is like the Disney World of U.S. National Parks. There's a shuttle bus that takes you through the park (cars aren't allowed to drive around during the high season), and at each of the nine stops, there are a bunch of fun and interesting hikes, several of them perfect for kids. 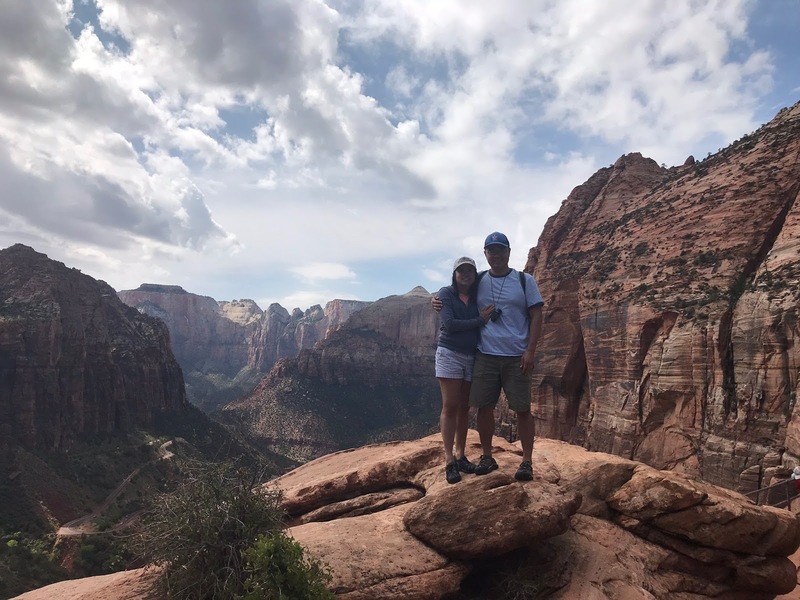 We combined a three-day visit to Zion with a day in nearby Bryce Canyon National Park and a day in Page, Arizona, in late August, and it was a wonderful mix of adventure, beautiful scenery and, of course, plenty of time at the hotel pool. Unlike at Yellowstone, it's not terribly important to stay within the park to enjoy it, and we found the Desert Pearl Inn in Springdale to be perfect, just three minutes from the park entrance and within walking distance to dozens of restaurants and adventure outfitters. The rooms are spacious, clean and comfortable, with kitchenettes and small tables for dining. We had a room looking out onto the large pool, with a majestic view of Zion's towering red peaks. There's nothing more awesome than sitting in the hot tub and looking at that view. Plus, on the premises there's a laundry room and an excellent restaurant called Moki. You never have to leave the hotel — except to go hiking at Zion, of course! Our first activity in the park was to take a one-hour horseback ride with Canyon Trail Rides (Bus Stop 5: Zion Lodge). The path we took followed the Virgin River — the horses actually had to cross the river, which was thrilling! — to the Court of the Patriarchs, a set of three towering sandstone peaks. Kids have to be 7 years old to ride, and the horses were very well behaved. If you're visiting in the summer, I recommend booking one of the earlier rides that start at or before 11am, to avoid the afternoon heat. Right across from the Zion Lodge is the Emerald Pools, a kid-friendly hike that can be adjusted for age and hiking ability. There are three levels of pools: lower, middle and upper. Our original plan was to hike all of them by doing a loop from The Grotto (Bus Stop 6), along Kayenta Trail to all three pools (map here), but weather-related closures relegated our hike to just the Lower Pool. As it turns out, that's about all we could manage in the mid-afternoon heat — a one-mile out-and-back. The entire trail to the Lower Pool is paved, making it easy to navigate with small children, and the payoff at the end is a wet path that leads behind a small waterfall. Getting sprinkled on by the falling water is a real relief in the heat. 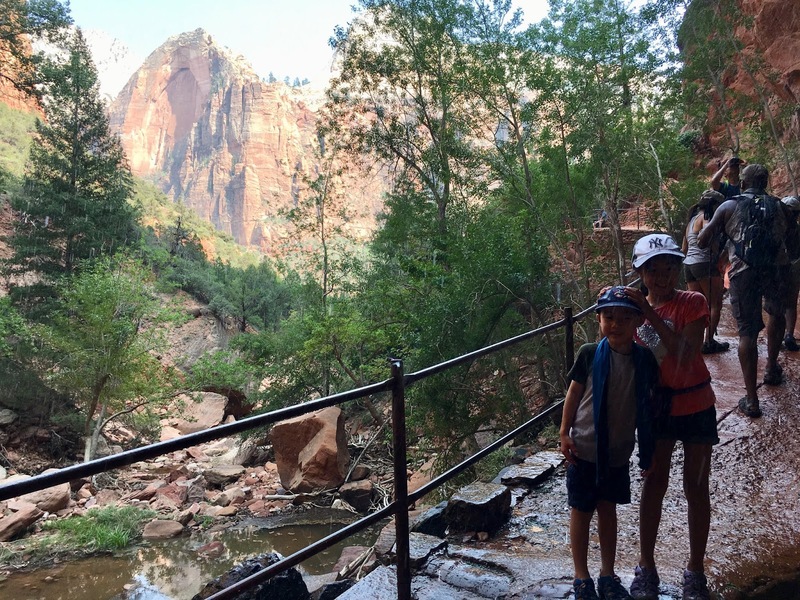 The Narrows is a classic Zion hike (along with the decidedly less kid-friendly Angel's Landing), and we all had a blast with it. The entire hike takes place in the Virgin River, so proper footwear is definitely required (trek shoes or water shoes with a hard toe). My friends who came with us got their kids neoprene socks to go with their trek shoes. A walking stick is also an excellent idea for keeping your balance on the slippery rocks and against the stronger currents. The Narrows bottom-up hike begins at the last shuttle stop (No. 9), then requires a one-mile walk down a paved path to the river. Once you're in the river, that's when the real fun begins. You start off wading through shallow waters, then the river starts to get deeper in parts, and the walls of the canyon start to close in. Still, there are many sections where you can take a break along a sandy shore, and the water never rose above my knees (or my kids' waists), so it's manageable for elementary-aged children. My 7-year-old son was able to do the hike just fine. The Narrows goes on and on, becoming deeper and more treacherous, so at one point you'll have to turn back if you're bringing along kids. We hiked for about an hour in, then another hour out, with a snack break in between. Here are more of my tips and tricks for hiking the Narrows with kids. 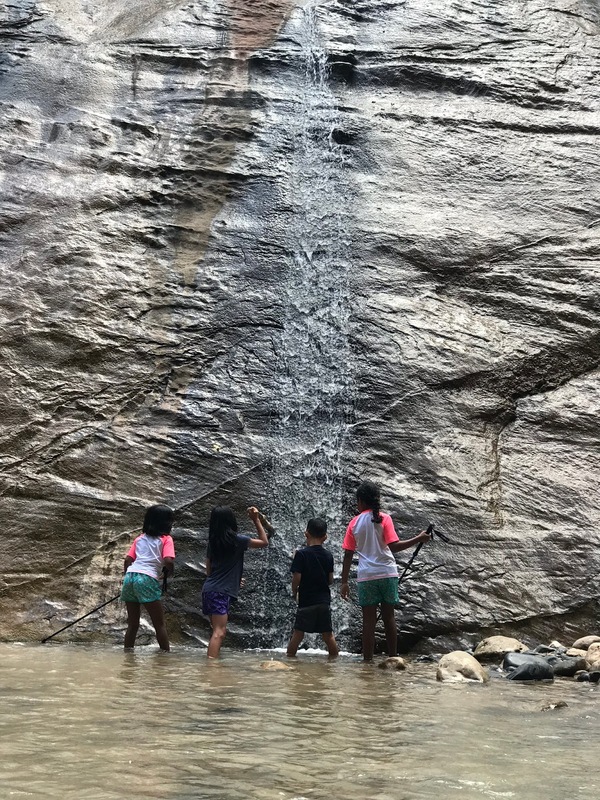 A short hike that kids can easily do on a hot afternoon is Weeping Rock Trail (Bus Stop 7). The entire out-and-back hike is about half a mile, but it's a steep climb up a paved path. The payoff is worth it, though, a stone patio that looks out from under a "weeping" rock — a curved alcove with water permanently dripping off the top. In addition to cooling off there, you get a stunning view of the peaks from the patio; that's where I took the photo at the top of this post. The last hike we did in Zion was slightly more death-defying, but if you've got kids who can follow directions and are willing to hold your hand, it's perfectly safe. The Canyon Overlook Trail is found off the glorious Zion-Mt. Carmel Highway, which snakes from one side of the park to the other (and is worth the drive for the astounding panoramas). The out-and-back trail is only one mile long, but what a mile it is! As you go up, up, up toward the scenic overlook, your journey takes you onto the slickrock and across several hair-raising paths, where you're separated from a plunge into the slot canyon below by just a railing. It's sort of like Angel's Landing Lite, and perfect for adventurous little hikers. Then there's the view at the top of the trail, which is so beautiful it feels unreal. There are also several small peaks for rock scrambling at the top. We spent an hour at the Canyon Overlook viewing area alone, taking pictures from every angle. We weren't there at sunset, but were told that it's spectacular there. 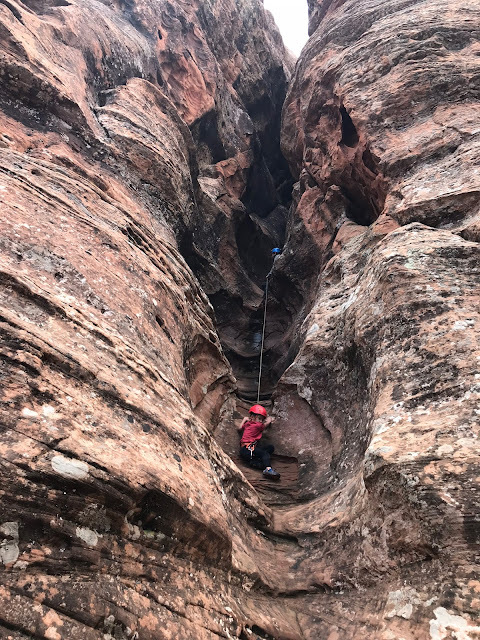 The last thing we did before leaving the Zion area was go on a half-day family canyoneering excursion with Zion Adventure Company. This activity is meant for families with kids ages 4 to 12 and is the perfect introduction to rappelling, rock climbing, and rock scrambling. I've done all these things before (without the kids), and even I learned a lot about the mechanics of canyoneering. Usually on these sorts of tours, the guides will hook you up on their ropes system and send you off, but with this company, the guides have you attach yourself to the rope system (always making sure you're getting it right) so that you really learn how to do everything. Even the kids were able to follow our guides' precise and kid-friendly instructions. And boy, were those guides patient. We had two, Ross and Benton. My son was so scared during the first rappel that he started to cry. But Ross patiently talked him through everything, and by the end of the excursion, he was happily climbing up a steep rock wall called Copperhead. We also got to scramble through the most narrow slot I've ever seen, only wide enough to fit one person walking sideways at a time. It was an amazing four hours, and I can't recommend this excursion highly enough! We sampled many of the restaurants around Springdale, the town right outside of Zion, for lunch and dinner, and many were very tasty. Some of our favorites included MeMe's Cafe, Oscar's Cafe, and the above mentioned Moki. We also loved the creamy and flavorful ice cream at the Bumbleberry Gift Shop and Springdale Candy Company. Inside the park, we had lunch at the Red Rock Grill by Zion Lodge. The food wasn't as good as at the restaurants outside the park, but it's an easy place to grab a bite if you're between activities within the park and don't want to give up a parking spot at the visitor center. If you're flying into the area, the Las Vegas airport is the closest one to Zion and you may end up spending a night or two there. While Vegas is decidedly adult-oriented, there are some activities that kids can enjoy as well. Here are my recommendations on what to do, see, and eat in Vegas when you have children in tow. And as I mentioned, Zion is a great home base for a day trip (or longer visit) to nearby Bryce Canyon. The town of Page in Arizona is also close by, and I highly recommend making the trip out there to experience the otherworldly Antelope Canyon.